Why cuts? There are two reasons Kasich is asking his agencies to cut spending. First, tax revenue is not growing as fast as forecasts suggested, which is hardly surprising when the state cut income taxes, primarily on those at the very top, for 11 of the past 12 years. On top of the revenue shortfall, Republicans still want to cut taxes even more. Incoming Senate President Larry Obhof wants to see fewer tax brackets and ultimately a flat income tax. The income tax is the state’s most progressive tax, meaning that people with more income are asked to pay a higher rate. Eliminating brackets or “flattening” the tax would make it more regressive and would cost people at the low end more while cutting taxes for those at the top). That’s a pretty stunning list. 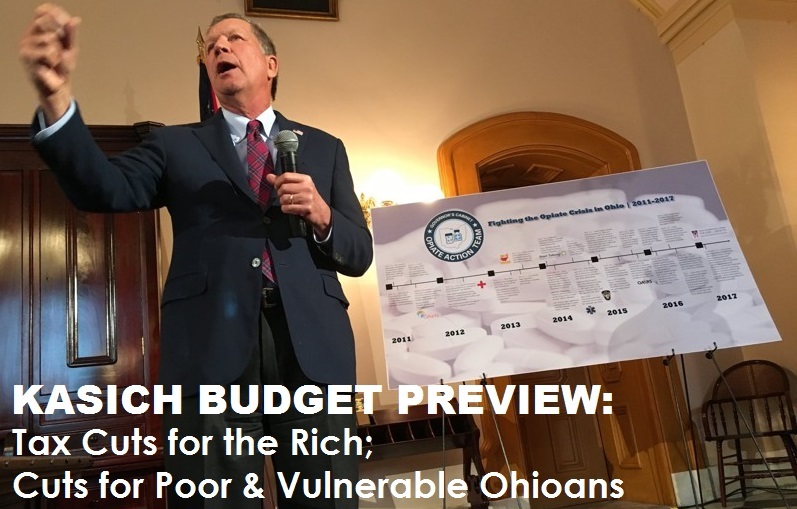 In order to pay for more tax cuts for the wealthy, Ohio will reduce services for drug addicts, people contemplating suicide, foster children, the disabled and people caught up in the criminal justice system. While the Republicans talk about their laser focus on jobs, that list includes two programs that help match employers and employees. Meanwhile, there’s little evidence that 12 years of tax cuts have resulted in any new hiring. Separately, House Speaker Rosenberger named among his chamber’s priorities programs to help slow Ohio’s drug crisis, which could put him at odds with the Governor over program cuts. The House will also move on a bill that unexpectedly stalled during the lame duck session to treat intimate partner or dating violence like other forms of domestic assault. Ohio is one of only two states that does not currently extend protections to unmarried partners.